Alhamdulilah we have reached the half-way point of Ramadan. On one hand I feel pleased with the achievements I have made and pray inshallah that I am able to continue with them. On the other hand a sense of sadness that this beautiful month’s blessings are set to end. I pray inshallah that our fasts are accepted, that he helps those muslims stuck in refugee camps or are displaced, those that do not have enough food or water, those whose families have been torn from them, that those who are in the process of leaving this world are able to do so easily, that most of all Allah(swt) rains his mercy on us and finally that he guides our non-muslim families to the right path. Ameen. 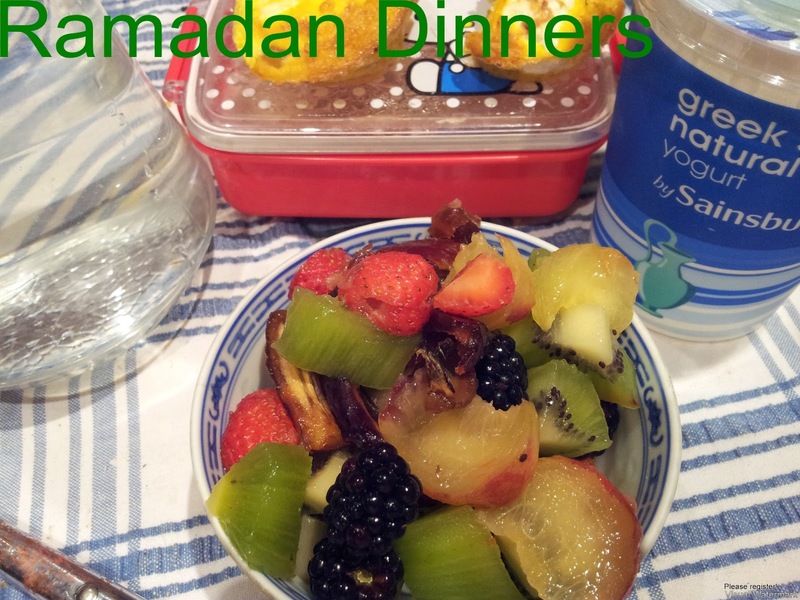 The funny thing about this iftari was that I really was unable to think that day. I couldn’t decide what to make for dinner. My husband’s contribution was South America which was great but I really didn’t want to go to the shops and yet this meal came together really well. Normally arroz rojo is spicy. I decided not to make mine spicy as everything else was spicy and we also have a spicy v non spicy conflict in our house. So it is always nice to make something which works for both sets of people. Wash and leave the rice to soak for at least 20 minutes. Use a pan large enough to hold the cooked rice. Slice the onion and allow to brown in the oil, then add the clove of garlic, then add the cumin seeds. Chop the tomato quite finely, add the tomato, it’s juice and seeds in to the pan and allow to cook slightly with the onions. 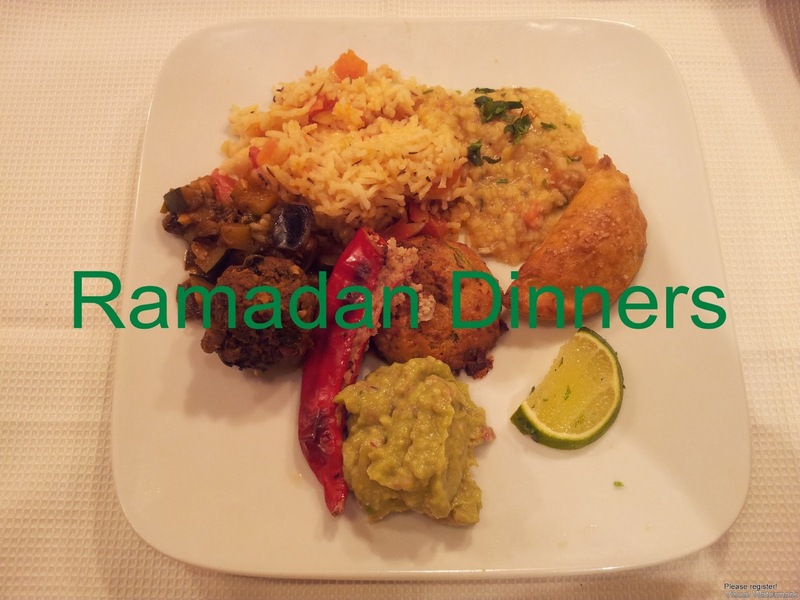 25 minutes before iftari, drain off the rice and place into the pan with the tomatoes, heat up on a moderate heat to allow the rice to be mixed in with the tomatoes. Then add enough water to cover the rice so that when your finger is on top of the rice the water should reach the first line on your index finger. Bring to boil, then turn down to a low heat and put a lid on the pan. Allow to cook gently. Check the rice at 20 minutes it should be soft and fluffy. I used long red chillies for this, but any that are large enough to handle would work well. Just try and beware of the heat of the chillies so that you don’t make the stuffing too hot. Wash and deseed the chillies, cut a slit along the side and take out the white bits and the seeds. You can keep some seeds aside and put them in to the stuffing. I used the percentage of 50:50 brazil nuts to mature cheddar cheese, I put these in a food processor and then blitzed till they were fine. Finally add in some of the chilli seeds. There is no need to add salt as the cheese is quite salty. Put the cheese mix into the chillies. Put into a 250 degree oven for 10 – 15 minutes or until the chilies are cooked and the cheese is melting. These were literally thrown together as an after-thought and everyone loved them. I made these using the left over stuffing mix from above, simply by adding freshly chopped coriander, egg and some gluten free flour to the mix until it formed a wet dough. I shaped into balls (making sure to wet my hands so that the dough did not stick to it) and then cooked into the oven for about 15 minutes at 250 degrees. One of the things that I do every year before Ramadan is to make up huge batches of spiced meatballs, cook them and then place then (in a box) in the freezer. I find they are very easy to use in different recipes and are excellent as a fall back for when you have unexpected guests. If you don’t have spiced meat balls already in your freezer you could make some up fresh simply by mixing minced beef or lamb with onions, garlic, ginger, green chilli, egg and dry spices to taste. Alternatively use less spices and make them milder. Form golf ball sized balls then shallow fry on all sides, then allow to cool before freezing or going on to use them in this recipe. Heat the oil in a pan and add the onion and cook gently until browned, raise the heat and then add the cumin and coriander seeds, aubergine and courgette and garlic. Turn the vegetables in the onions until they are heated then add the chipotle powder and stir through again. Then add enough water to cover the vegetables and then simmer for about 15 minutes or until the vegetables are cooked through and are soft. Add in the meatballs and add in enough water to cover the vegetables and meatballs and allow to simmer gently for about 20 minutes. Instead of having re-fried beans I opted for making re-fried dhal. I had ready cooked dhal in the freezer which I just defrosted and just fried off in cumin seeds and sliced green chilli. You could literally do this with any cooked lentil or pulse. As muslims (not of Palestinian origin) we say that Palestine is constantly on our mind. Indeed our duas frequently mention the plight of the Palestinian people. With this in mind I thought I would try and recreate a dish with a thousand recipes and for which I have no doubt that at least a few people will email me to tell me that this is not how their mother prepares this. As I am not Palestinian please forgive me Inshallah. This is my version of the dish, with a few of my influences thrown in! So let us start at the beginning, what is Maqluba? 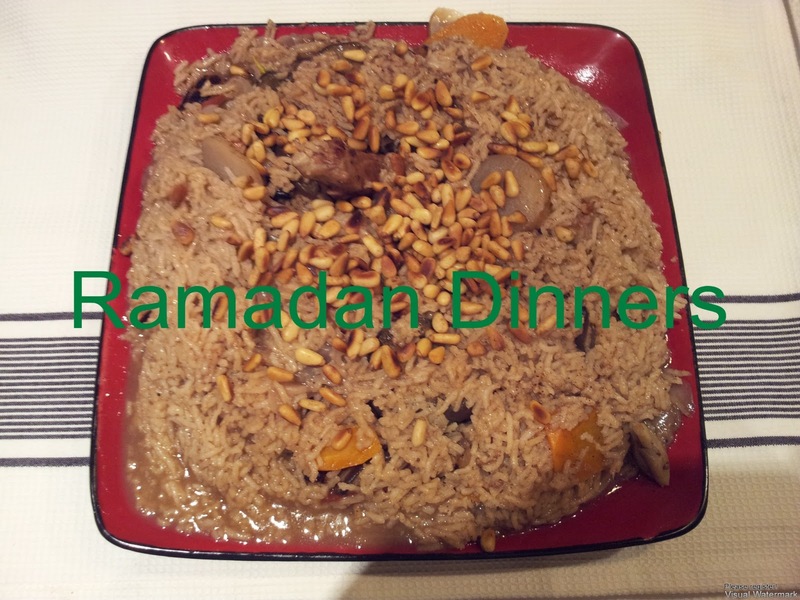 Maqluba is a dish made of rice, meat and vegetables. The general rules seem to be these: if you are making it with lamb you must include aubergine and if you are making it with chicken you must include cauliflower. 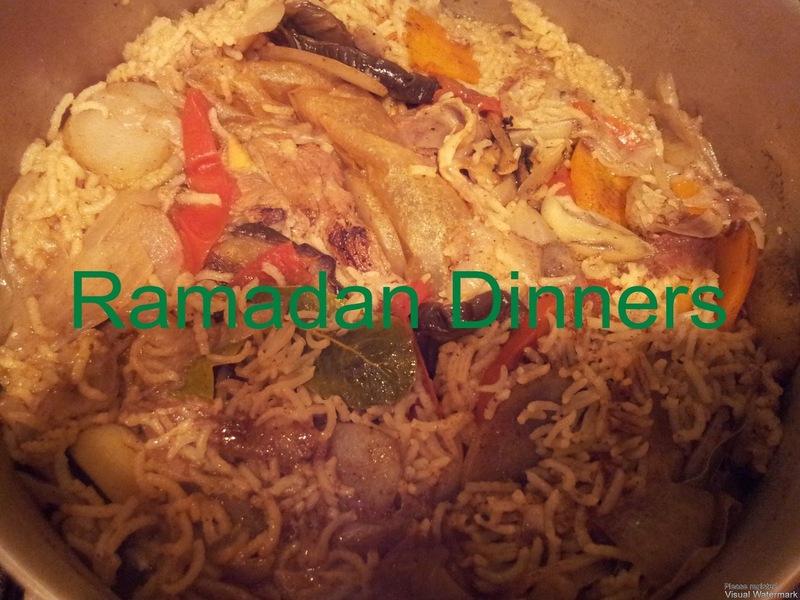 Finally once the rice is cooked you must flip the rice out of the pan on to a plate as Maqluba means upside down. As with all things that are served upside down you must try and make the top look pretty. This dish is vegetable rich and so while there is meat in here, I have scaled it down slightly as I didn’t think it needed so much in it. 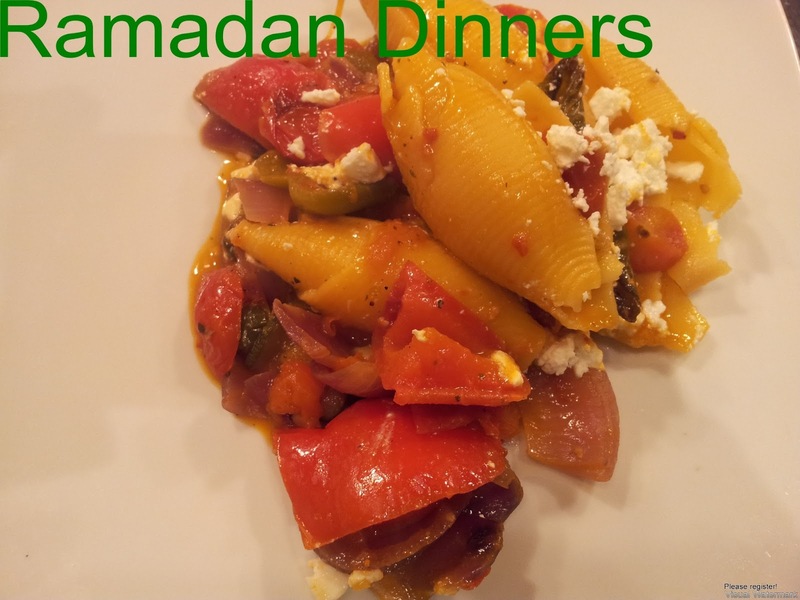 Normal Maqulba tends to be dry (ie no residual juices left behind) however I wanted this to be a dish within itself and after fasting I knew we would all want something with sauce. Put all the ingredients into a pan and bring to the boil, then simmer until the lamb is soft and tender. Then take off the heat. If you want to make this in advance, you can do. This can also be frozen at this stage. Wash and soak the rice in cold water. Leave it for at least 20 mins. Slice the aubergine thinly into rounds, then drizzle with oil and place in a 250 degree oven for 20 minutes or until cooked. Slice the tomato, carrot, aubergine and onion and keep each item separately ie not mixed in with each other. Place the meat and the meat stock through a sieve and reserve in a pan. Place the meat to one side then fry the sliced onion in 1 tablespoon of oil, once the onions have browned slightly add the lamb chops and increase the heat to high to help render down the fat of the lamb and brown the lamb. Then take off the heat. Dry fry the pine nuts and then add the butter, before taking off the heat and setting aside. Take a large pan – ideally with handles on the side, large enough to hold the rice when cooked and all the ingredients, and cut the circumference of the pan out of the baking paper. Place the baking paper into the pan. This will save on washing up time! Spread a thin layer of the oil on to the baking paper, in the pan. Now layer the meat on to the baking paper. Followed by a layer of aubergine, then a layer of tomato and then a layer of cooked onions. Now it is time to season with salt, pepper, a teaspoon of cinnamon and a teaspoon of allspice. Followed by a layer of potatoes, then a layer of carrots. Then another layer of seasoning, omitting the salt. Drain the rice. Place the rice of top of all the layers. Try and arrange it as flat as possible. Add two bay leaves. Pour the stock into a jug or a glass. Hold a plate above the rice pot and pour the stock into the rice. As the objective is to keep the layers as still as possible, pouring it on to plate will ensure that no holes will appear in the rice. Once the stock is in the rice, put your index finger into the water and sit it above the rice. The water/stock should reach the second line on your finger. If the water does not reach here, top it off with some tap water. Bring the rice to the boil. Do NOT STIR THE RICE. Once the water has bubbled, turn the heat down to the lowest heat put a folded clean tea towel on top and put the lid on top of it and leave to cook for 30 minutes. As this is for iftari I would put this on to cook 45 minutes before iftari. After 30 minutes of cooking, check the rice. Be careful as the tea towel will be boiling hot. The rice should be soft and tender to touch. If very top layer of rice has not cooked, DO NOT STIR THE RICE, use a spoon to push the rice down in to the water. Hold the rice down with the spoon if needs be. Cover with the tea towel and the lid again and leave for 10 minutes or until cooked. To serve, find a plate or a platter at least 3 cm larger than your pan. Remove the tea towel and the lid. Place the plate on top of the pan, and place a length wise folded tea towel (2 folds) on to the plate, and use this to grip the pan handles. Then very quickly flip the pan on to the plate. Allow the pan to sit on to the plate for a couple of minutes before removing the pan. Carefully remove the paper. 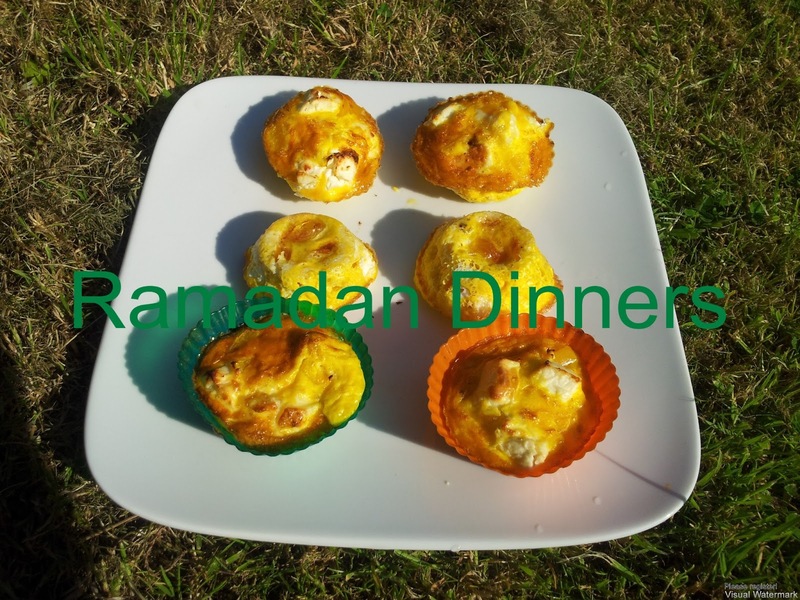 Sprinkle the pine nuts on top of the Maqluba. Serve with plain yoghurt. On Saturday night we opted to have a Malaysian inspired dinner: Mee Goreng. The Mee refers to noodles and it is normal to use egg noodles, as I have coeliac disease I can’t eat them so we used flat rice noodles but to be fair any noodle would work. Similarly if you don’t have noodles to hand make this with rice and suddenly you have Nasi Goreng! Everything is adaptable! Traditionally the noodles are fried in oil, but after a very long hot day fasting, fried food is very unappealing to me. I find I want the flavour of different food but I don’t want anything too heavy which is going to feel stodgy or make me sleepier than I already am. Made this way, this is light on the stomach but also filling. Normally Mee Goreng is served with the noodles mixed into the sauce. In our house we are at extremes in terms of how hot and spicy we like our food. Often it is easier to serve something separately to allow those who like things mild to add more noodles and for those who like things spicy can add more heat. We served ours with a spicy chilli mellange on the side for the people who like heat. Add small amount of water then slowly add sliced tomatoes, and allow to the mixture to simmer for 15 minutes approximately until the texture resembles a thick soup. Empty the mixture into another bowl. Stir fry the vegetables all together in a wok until cooked. Boil Noodles for 5 minutes. 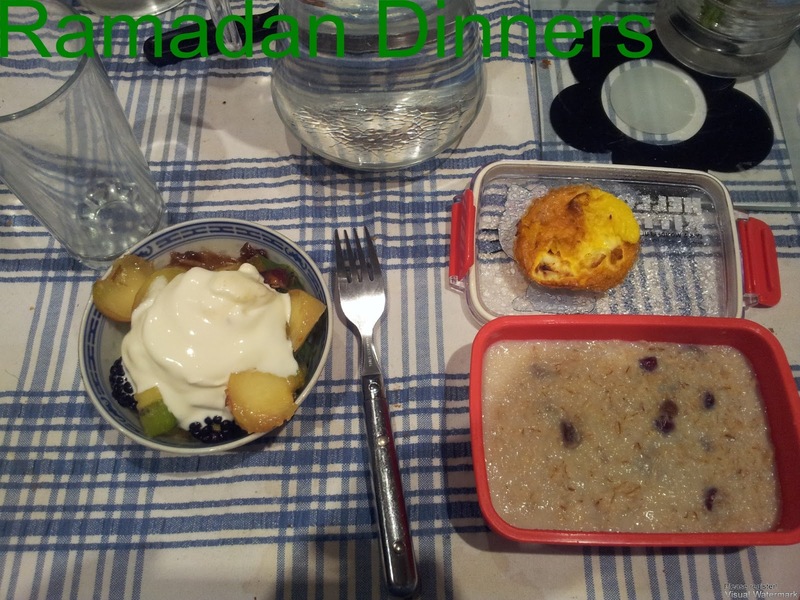 Alhamdulilah ( All praise is due Allah (swt)) another fast has been completed. I always find day 3 the hardest. A challenge and I’m not really sure why. I think my body tries to resist and the lack of sleep and change of routine starts to get to me, Alhamdulilah by day 4 I think my body accepts that this is just the way things are. Inshallah your bodies are coming to accept the changes that this month is bringing about. I pray inshallah that while Ramadan is supposed to be hard, that the month gets easier as we go progress. On day three I was feeling not myself at all. I wanted to eat something comforting. We had already chosen to eat Pakistani food so it was fairly easy. I made a very lightly spiced dhal which would be gentle on the stomach. Unfortunately my husband does not eat dhal so I had to make something else as well. 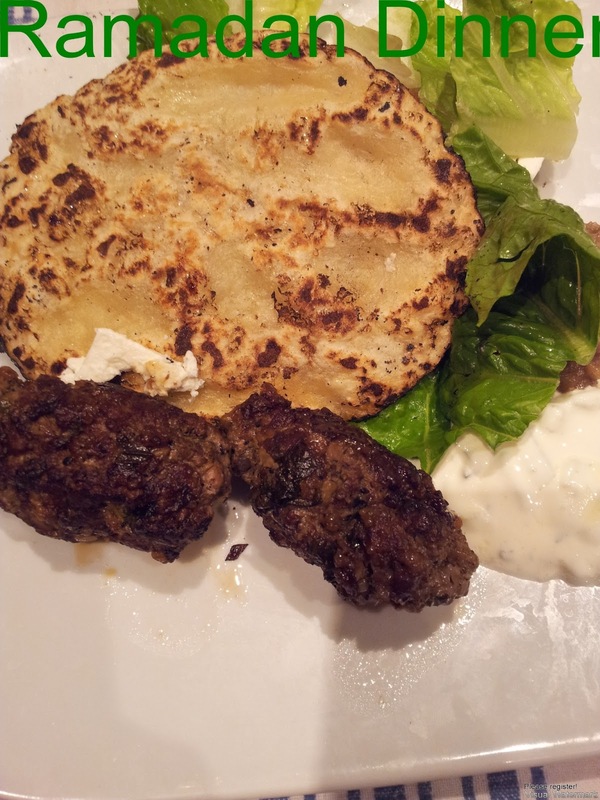 I decided to opt for a spiced lamb heavy on onion and black spices, omitting tomatoes, and topping off with creamy Greek yoghurt and finished off with finely chopped coriander. I really loved this meal as the slow cooked lamb with a creamy tang and the dhal were just what I needed to perk me up a bit. Alhamdulilah! Yesterday marked the 18 year anniversary of the Srebrenica massacre that took place during the Bosnian war. Hundreds and thousands of Bosnian men, women and children were in killed in a targeted campaign by the Serbs who had previously been their neighbours, friends and perhaps even family. “The Serbs began at a certain point to take girls and young women out of the group of refugees. They were raped. The rapes often took place under the eyes of others and sometimes even under the eyes of the children of the mother. A Dutch soldier stood by and he simply looked around with a walkman on his head. He did not react at all to what was happening. It did not happen just before my eyes, for I saw that personally, but also before the eyes of us all. The Dutch soldiers walked around everywhere. It is impossible that they did not see it. What stood out in memory of the news was the way the news needed to make the Bosnians sound more European with phrases like “they eat a little pork”, “they like to have a drink” but what seemed apparent to me was that they were muslims. May Allah (SWT) grant those who were killed jannah, may he grant those who were abused and tortured the strength to move forward with their lives and give them happiness and may he ease the pain of those left behind. Ameen. 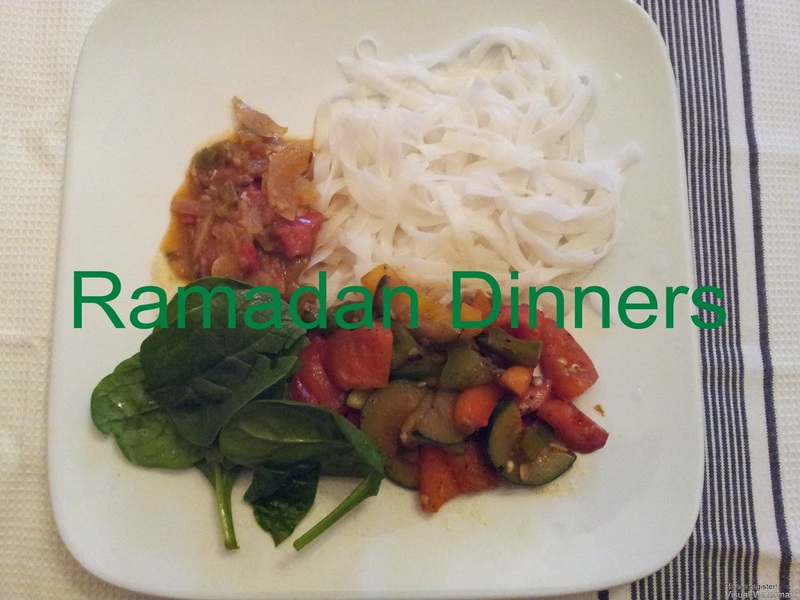 Last night saw us eat a very simple main course which was very easy and effortless to make. This is inspired by the Bosnian side dish, or dip, called Ajvar. Popular throughout the region Ajvar is normally made in autumn when these vegetables are in abundance. Traditionally made from red peppers and aubergines which are roasted on an open fire. The cooking on an open fire helps to add a smokey taste to the final dish. Once cooked the peppers are skinned they are ground to a mush. Salt, pepper and oil are added to help preserve and concentrate the end product. Having neither Ajvar to hand I decided to do what I could. Wash and chop all the vegetables into bite size pieces (peel the onions) and place them in a high sided baking tray. Peel and lightly crush the garlic and place into the baking tray. Sprinkle with salt, pepper and a pinch of chilli flakes. Drizzle with olive oil until the vegetables are lightly coated. Place in 250 degree oven for about 20 – 30 minutes, or until the vegetables are cooked and are very slightly smokey. Pour a quarter of the vegetables and some of the juices in to a food processor and blitz until you have a smooth paste. Add a little water into the processor if needed to help the processor. Remove from the processor and place into a pan large enough to hold both the vegetables and the pasta. Add the remaining vegetables and juices to the pan and processed vegetables. If the sauce seems a bit tight add a little water and heat up to bring the sauce together. Cook the pasta according to the instructions. Drain and add to the vegetables. Crumble feta cheese into the pasta and serve. To an extent we all follow in his footsteps. 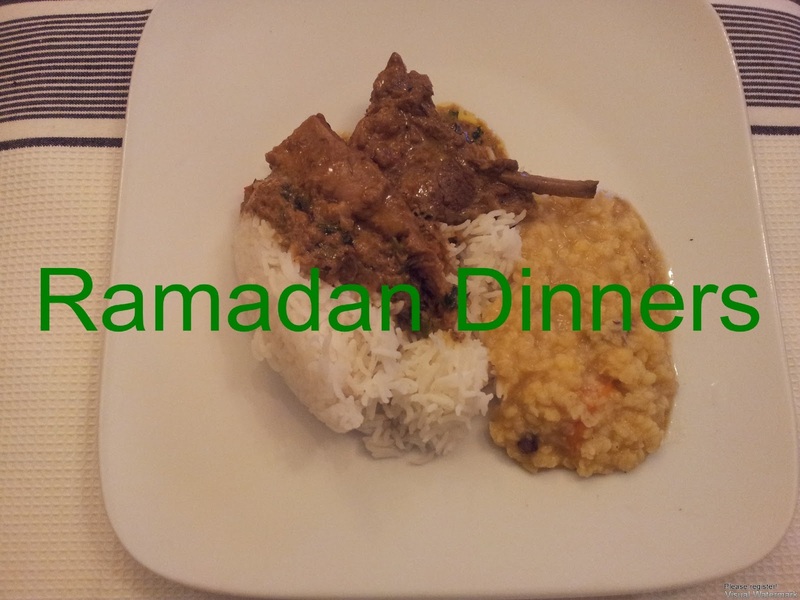 To say, however, that my culture’s food is better than your culture’s food when it comes to Ramadan is just silly. There is no nation in Islam. We are just muslims. 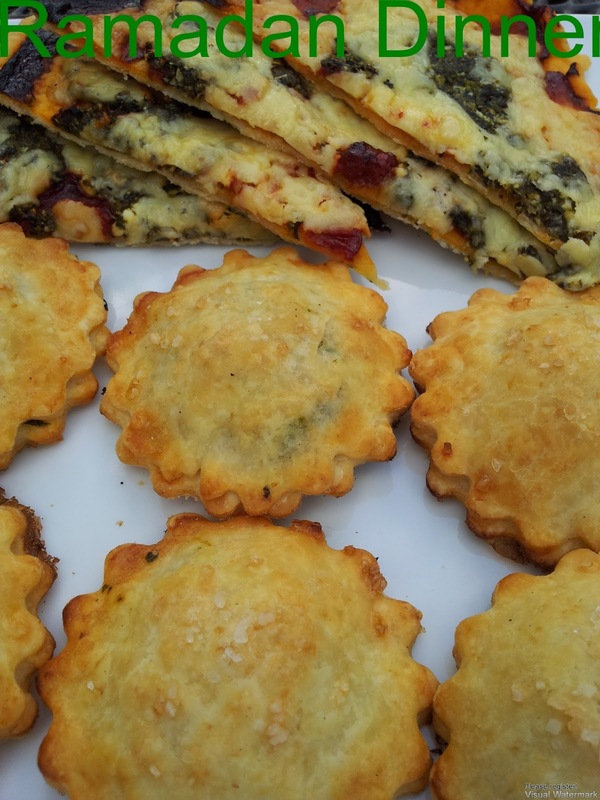 Post Magrib: spinach and feta mini gluten free pies, spinach, tomato and cheddar pastry wedges, home made beef sausages/ovals, gluten free flat breads, Greek salad, tzatziki, aubergine dip, washed down with the Lemon Mint Cooler I made a few days ago. Mix everything together in bowl. Then make the sausages out of the mince. They should be about 2 -3 inches in length and about an inch in thickness. Shallow fry the meat gently until cooked. Serve. Alternatively if you want to cook these in advance, do as above and leave to cool and store in a sealed container in the fridge. About 20 minutes before iftari place an inch of water in a saucepan and then place the sausages into the pan. Cover with a lid and put on a low heat checking from time to ensure they do not burn. From time to time baste the meat with the meat/ water juices. You could heat them up in a microwave if you are space short. I find the meat goes stiff and loses some of its moisture. Prick an aubergine with a fork. Put it in the oven and allow to cook for about 15 – 20 minutes until it starts to look collapsed. Scoop the flesh out. Put the flesh into a food processor and add a clove of garlic, olive oil and salt. Whizz up until smooth. For this I used this ratio: 4 parts cooked frozen spinach to 2 parts feta cheese and 0.5 parts mint leaves. Squeeze all the water the defrosted spinach. Chop the mint leaves and mix into the spinach. Cream the feta into the spinach. Use a pastry cutter to cut the pastry, then layer a flat on to the pastry leaving room by the edges, get another cut piece of pastry and brush with water on one side and place on top of the filling and press down gently along the edges. Brush with milk/egg wash. Top each pie with a little coarse sea salt. Cook in a 250 degree oven for 20 mins or until puffed and lightly golden on top. I hope that your first fast went well. Please remember to make dua for those who are less fortunate than ourselves, who are plagued by war, who are abandoned, who are sick and those without families. Ameen.